1. Pick up a crayon. 2. Scribble to your heart’s content. 3. Light it up with water. 4. Repeat, until your heart sings and the flowers BLOOM! My work here is done. With art supplies at the ready, we can go anywhere. We can create a beautiful reality in front of us, no matter how crazy life becomes. Bloom, people! Thank you. March is almost here *applause applause*! 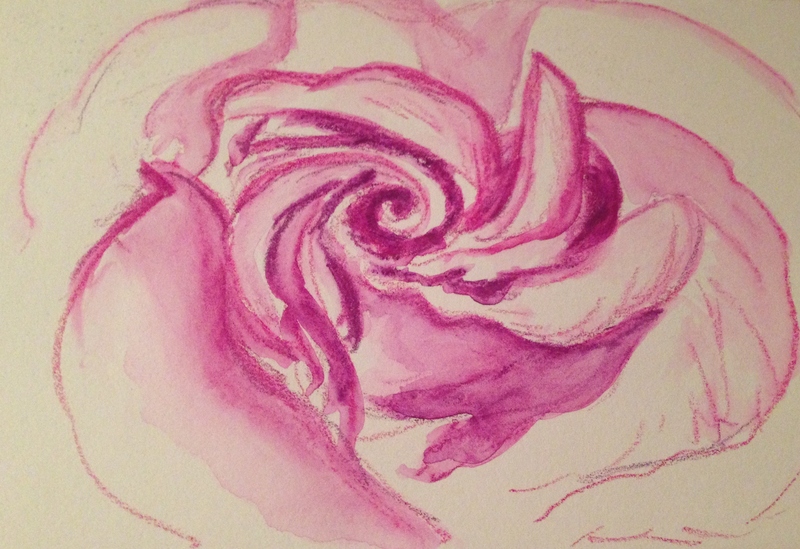 “Bloom, people!”….Lovely call to creative action…thanks Laura. This is wonderful! Love your step by step instructions, too! So precccciousssss (also in my Gollum voice). love Gollum LOL…. brilliant way to play, play with color and line, imagination and Creativity. lovely! Thanks, Debi! The Neos bring fast results, which is what I’m looking for during busy season. Glad you enjoyed! Thanks, Charlie! :)) Love them! Thanks, Kerfe! Our crocuses are coming up. I hope that snow skates right on by! Haha, thanks Jodi! Happy week to you, my friend! I’m just heading off to bed, now I’ll dream in beautiful glorious shades of pink. Sweet dreams Laura. Thank you, Sharon, and to you my friend! “Let us seeeee your beautiful colorssss (in my Gollum voice)”- okay that completely cracked me up – great! Oh I love this rose! Beautiful! I love roses! Painted in any way. Thanks, Suz! They’re a challenge but the Neos help to get the essence down, I think. I hope. lol.